We are a dry ice supply company based in Preston Lancashire. We provide dry ice along with equipment, training and staff within the hospitality industry. Order dry ice before 3pm and we offer a free next day delivery service to your establishment. With a fantastic reputation across the North West, we can guarantee you the very best dry ice expertise and equipment only a call away. We supply dry ice and equipment designed to cage dry ice for food and drinks. With years experience working in hospitality we understand the importance of innovation and creativity to compete in the market. That’s why we thrive on supplying the the best dry ice training and the most innovative and safest equipment on the market. 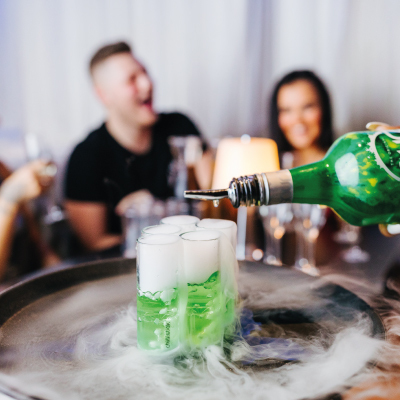 Dry ice can be used for all sorts of interesting and creative reasons, more recently; mixologists and chefs have been using dry ice in food and drinks, to create dramatic theatre menus. This is where all our equipment and training come into play. What is special about our equipment is they have all been designed to cage the dry ice pellets with a patented safety valve, so you can use the dry ice in food and drinks safely. Not only are our products visionary but they are profitable, generating more sales and revenue to your establishment. Our industry experience with dry ice drinks and sales separates us from the competition offering you the very best dry ice training and equipment within hospitality. We’ve worked with Jodie from My Dry Ice for many years and can’t recommend them enough. As a bar owner, you need to ensure that the people you work with are safe, reliable and trustworthy, and that’s something we get from Jodie and her team. 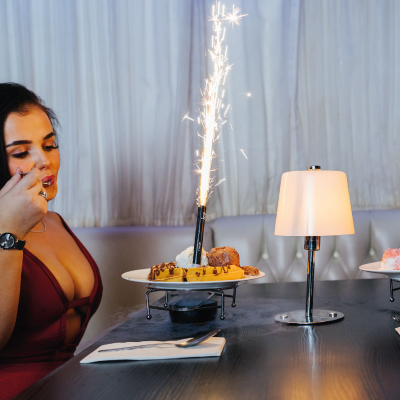 The customers love the dry ice shots, creating an additional wow factor and generating noticeable additional sales for the venue. I can’t recommend them enough. Jodie is an expert with the dry ice products; a hardworking and dedicated professional who is a pleasure to work with. The service provided from My Dry Ice was excellent. Jodie and the team were great with the customers and really up sold well to help us reach our targets. I would recommend Jodie to anyone who wants to sell shots as part of their business, friendly from the first stage of booking, throughout an extremely busy event, to the end of the event. Outstanding team work on a weekly basis.They work alongside us, always having smiles on their faces, fabulous team due to smash it out each weekend. The best way to promote my drinks is with My Dry Ice it Increased attention to my exhibition stand generating more interest and sales. Working alongside my dry ice they provide excellent customer service and products. Thank you for the quick delivery and explaining everything I needed for my event. We supply food grade dry ice for use in food and drinks, the dry ice has no taste, odour and colour and leaves no oily residue, therefore perfect to use in food and drinks. Our dry ice equipment and training are exceptional. We offer the most innovative and safest equipment along with specialised training so you get the best use out of dry ice. Dry ice is premium product which Generates increased sales to your establishment. Dry ice slows down the drinking process, supporting the drink aware campaign. Customers love to photograph the fog effect and post the trend on social media increasing your online presence. Dry ice arouses your 5 senses. 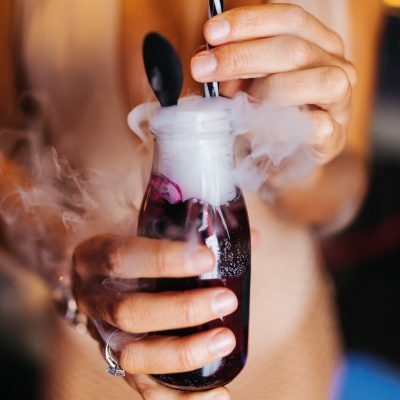 When dry ice drinks are created you can See the fog, hear the bubbles, smell the essence, feel the vibrations and taste the liquid, creating a exciting sensory experience for your clients. The Ice Cage is designed to safely create large fog effects using dry ice within food and drinks. This quick and easy to use device cages the dry ice and can be used in imaginative ways to create smoking drinking vessels and table decorations. With its versatility the cage is great for a range of venues and events such as restaurants, bars,VIP experiences, Weddings , Themed parties and children’s and adult’s entertainment. The champagne bucket kit is used to cage dry ice in any ice bucket. It creates a dramatic fog effect safely within your bucket. This effect is a great head-turner for VIP areas and events. As you carry the bucket across the room the fog will fall to the ground like a waterfall. 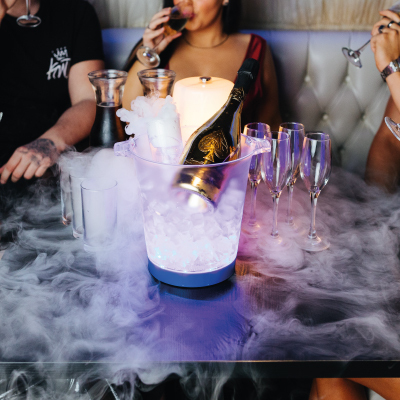 When the bucket is on a table and the bottle is handled for serving, the fog will create a smoke trail as it leaves and enters the ice bucket. This effect is simple, safe and effective and can create additional add on bottle sales in your restaurant or bar. Looking to create a unique drinking experience for your guests to enjoy. This Chillistick drinks stirrer is a safe solution to creating a dry ice smoking drink. The great thing about the Chillistick is you can drop it into any glass. Your guests can enjoy their favourite tipple whilst stirring the stick to create a reaction. 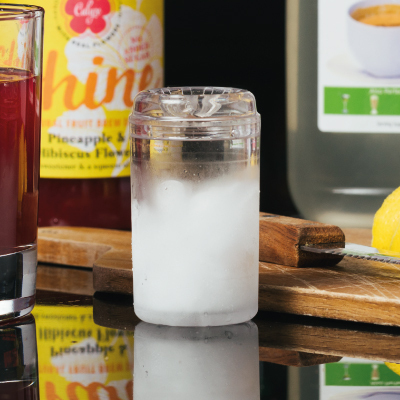 No need for ice cubes, load the Chillistick with dry ice and this chills the drink and enhances the smell of the liquid inside. Stir the stick, See the smoke, Feel the reaction, Smell the essence and taste the liquid. The perfect added touch for the ultimate drinks serve. The ice breaker shot glass is a innovative shot glass designed to cage dry ice at the bottom of the glass. 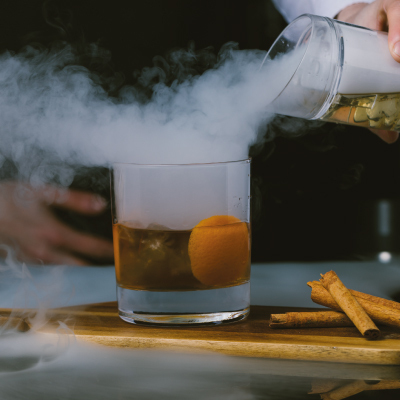 Load the glass with dry ice and add your chosen spirit to create a smoking shot. This is a quick, easy and effective way to create theatre at your bar and up sell drinks per head. Customers love to photograph the shot and post the experience to social media. Our range of ice fountains includes various durations (30, 45, 60 seconds), sizes and colours. We also offer hand-held ice fountains for dancers, performers and champagne bottle clips for sparklers to be clipped onto bottles. Prices depending on fountain and quantity. 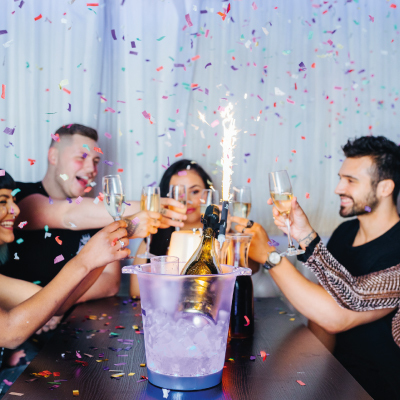 Our range of confetti cannons consists of twists action confetti cannons, giant cannons, push button cannons,champagne shower bottle ,party poppers and celebration crackers. Prices depending on cannon and quantity. The cloud pour is designed to pour an essence of fog over food and drinks. You can add any essence into the container arousing your customer’s senses. The Cloud pour is used by the famous chef Heston Blumensthal to create mouth watering flavours. Pour the essence over a cocktail or desert and watch as your guests are amazed by the smell and visual fog effect. 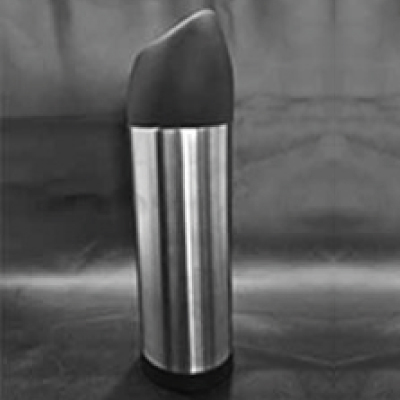 Our dry ice canister is designed to store your dry ice neatly on your bar and a tool to use to load your dry ice equipment without your staff having to touch the dry ice. The storage canister also insulates the dry ice meaning the dry ice may last a longer period of time within this canister. We supply dry ice across the North of the U K.When ordering before 3pm, we offer a free next day delivery service to your establishment. Our dry ice packs come in sizes 2.5kg-20kg. Larger dry ice packs can also be supplied. When dry ice is caged it can be used to create theatre within food and drink menus. It is a great way to create an added experience, to any hospitality event. We offer dry ice and equipment training for your staff at your establishment. Fear of using the dry ice or products incorrectly, we train your staff to use our equipment following our risk assessment guidelines. Price dependent on location and number of staff.